Y.A.P. IS DESIGNED TO HELP YOUNG ARTISTS FIND THEIR VOICE OF CONFIDENCE AND TRANSITION FROM HIGH SCHOOL TO ART COLLEGE. Y.A.P is dedicated supporting talented young artists from low income FAMILIEs by reaching out to PHILANTHROPIC organizations for financial aid. With customized one-on-one mentor weekly meetings, students work to develop their skills, concepts, and self-expression in an artist studio environment. In addition, this program offers guided museum visits to connect the students to their cultural heritage and expand their art history knowledge. In partnership with a select prestigious gallery in Los Angeles, Y.A.P. co-hosts an annual exhibition featuring the work created in the program. Y.A.P. creates a support system for young talent and aims to raise scholarship funds helping the students transition to Art College - making it possible for their dreams to become a career. My son Josh was always drawn to pictures, and doodled on his classwork and homework. Shortly before his 14th birthday he decided he wanted to become an animator. We began looking into what art schools sought after in their applicants. We realized we wouldn’t be able to accomplish meeting the requirements on our own. Josh needed a proper teacher - a mentor. We first heard of project AWE from a friend who highly recommended the program. It sounded perfect, and when Josh was awarded a full merit-based scholarship we made the commitment. Josh’s sessions included both studio and Getty museum guided visits. Project Awe was exactly what Josh needed and through this mentorship Josh’s skills and confidence increased dramatically. 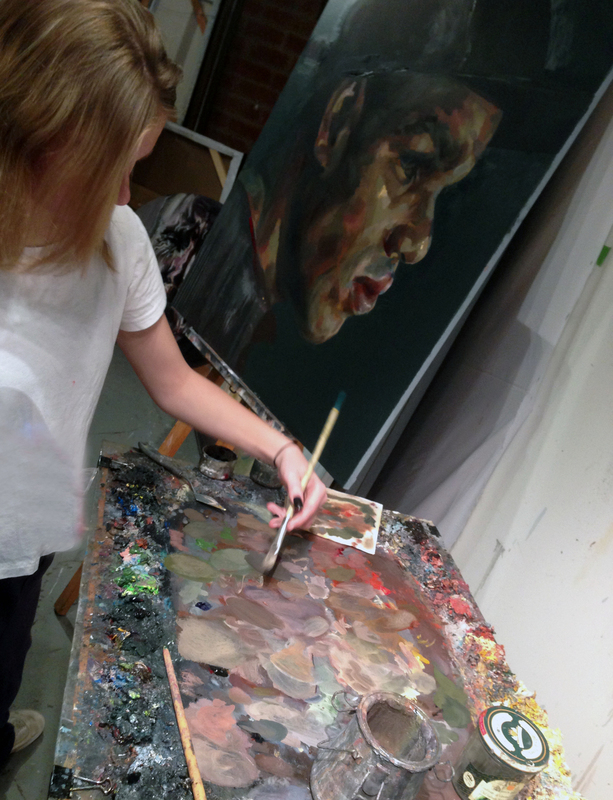 HANNAH DREW: A 17-YEAR OLD ARTIST AT Y.A.P. Hannah came to the Young Artists Program (Y.A.P.) studio when she was just sixteen years old. Even from first glance you could tell that Hannah had a precious ability of transferring her careful observations into beautiful lines. At project AWE we knew that with some structure and gentle guidance Hannah would mature fast into a confident young artist. Our goal was to provide Hannah with necessary tools while working on developing her individual voice. In between studio sessions, we visited museums to view old Master paintings. Hanna’s portrait of a Rabbi shows her successful integration of everything she learned in the last few months at the Y.A.P. studio while clearly making it her own. This pensive portrait is full of profound observations. Currently, Hannah is working on her first exhibition that will be made possible through Y.A.P. at project AWE. Y.A.P. IS UNIQUELY DESIGNED TO GIVE A PLATFORM SUPPORTING VOICES OF YOUNG TALENT. What do you like to paint and why? What is your biggest dream as an artist? Please tell us the name and the age of the student and their area of interest in the Arts.